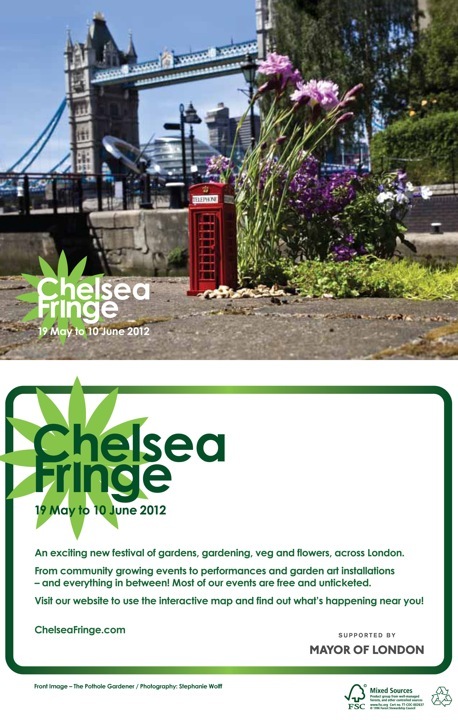 The first-ever Chelsea Fringe, the alternative festival of gardening, opens on Saturday 19 May. A compliment to the Chelsea Flower Show, the Fringe does things it cannot do and reaches places it cannot reach. There are no arcane judging systems, no grand judges, medals, prizes or patronage – and no sponsor, so it is entirely volunteer-driven. As long as a project idea is about gardening and flowers, and is interesting, it’s in. This spans community growing spaces and initiatives, garden installations, performances, street happenings, parties, talks and walks, special dinners, workshops, films and art – all run by visionary individuals who make things happen against the odds. FYI the chef at The Canton Arms on South Lambeth Road is whipping up a feast at Dinner to Dye for at Hackney City Farm.